Aspen is a peer, advocate and investigative journalist turned ‘mom on a mission’. She is the author of the best-selling and award-winning book: Med Free Bipolar. Struggling to help herself and her children recover from neurobiological disorders, she could find few answers from doctors, neurologists, Western or Eastern Medicine. She also had the added challenge of regularly “seeing” into the spiritual realm and having many visions that later came true. Try sorting that out with doctors and Baptist University professors! After finding the answers for her family in nutrition, brain-type testing, and supernatural healing solutions (like prayer! ), she started a passionate career and ministry an author, speaker, and NeuroCoach™. Losing her grandfather to Alzheimer’s only further fueled her research and mission to open her brain clinic. Utilizing the Dr. Amen Clinics Method and her own Med Free Method™, Aspen coaches in the Treasure Valley, Idaho, and internationally via FaceTime. She also carries her own professional line of NeuroNutritional™ supplements that target blood flow, oxygen and target “dead spots” in the brain to awaken functioning. Clients have worked with her from all over the world; some even flying to Boise, Idaho to be coached. She envisions having in-patient facility options for natural mental health, addictions, children’s services, eating disorders, self-harm and memory specialities. (That don’t exclude the possibility of a spiritual component). 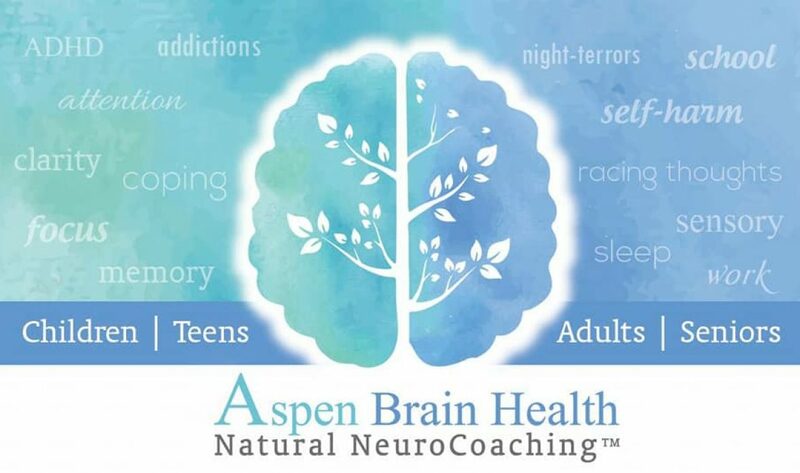 Aspen and a collaborative team of professionals work with children, teens, adults and seniors to help them thrive naturally (or with a combination of meds if they so choose). Main areas of concentration include: brain, heart and gut health, anxiety, attention, focus, energy, memory, mood, school/work/sports performance, sensory, night terrors, self-harm tendencies, racing thoughts, sleep issues, and anyone who just wants an optimized brain. Clients often experience more relief in two appointments than years of other treatments, resulting in focus, coping, better clarity and a renewed mind. Medication management, counseling and other modalities are outside the scope of her NeuroCoaching practice, but Aspen is happy to have teamed up with a great list of doctors (medical docs, osteopaths and naturopaths friendly to the med free method), chiropractors, neurofeedback specialists, counselors, detox specialists, and brain-scan specialists who can augment the work she does. Her local office is located inside Syringa Behavioral Health, Nampa, Idaho by appointment only, or WorldWide via the web.